AeroExpo UK welcomes Piranha Ribs Ltd commercial division to this year’s event at Sywell Aerodrome, 31st May – 2nd June. 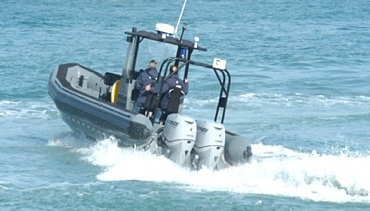 Piranha Commercial Marine manufactures a wide range Rigid Inflatable Boats and Pilot vessels to a commercial and military specification. They also specialise in a selection of extremely well built leisure RIBs. Piranha will be exhibiting a commercially built 10m open RIB rigged with twin outboards designed for charter and dive operations. The P10 will be competing in the Round Ireland RIB Challenge later this year. This hull is based on an original Ballistic RIB hull, extended, modified and updated to achieve maximum performance and sea keeping capabilities. The P10 is now one of the driest, fastest and best handling Rigid Inflatable Boats on the market. The concave chives system is a major asset to this craft. With the improvements and hard lessons learnt from commercial operators, this is certainly a craft to undertake the strenuous and rigorous Round Ireland Challenge. Piranha will also display a RIB from their leisure range which are one of the finest and recognised models in Europe. The new 420 Lux pictured.